Jackie Robinson's latest collection is bird-themed once again. 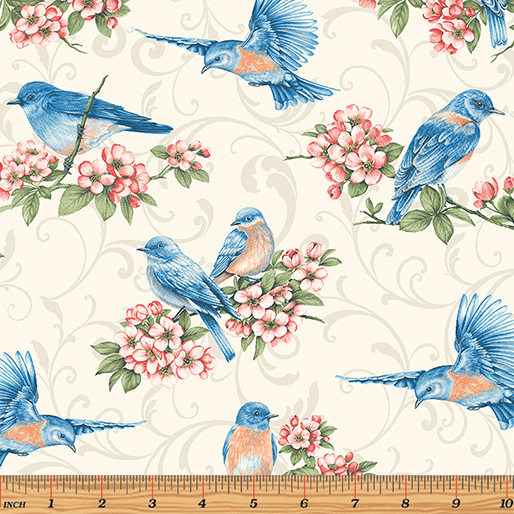 These bluebirds are sweet to look at and fun to sew with! The line includes a panel with six different block designs, Jackie's signature stripe design, and coordinates in a wide variety of shades and prints. 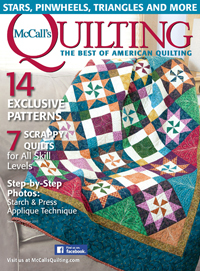 We asked Jackie to tell us about her new line, as well as a quilt she designed for McCall's Quilting using the fabrics. Why did you decide to create a collection based on bluebirds? Standing here in my sewing room in the spring and summer I see a lot of bluebirds right outside my window. Ours are the mountain bluebirds—they’re pure blue. They’re just pretty, and of course I’m a huge blue fan. I love looking at them. Though we do have some bluebird houses in the woods, we don’t put out any feeders because we have a cat. I’m not going to invite dinner! Tell us about the bluebirds in Bluebird Gathering. The collection has all three varieties of bluebirds: Eastern, Western and Mountain. 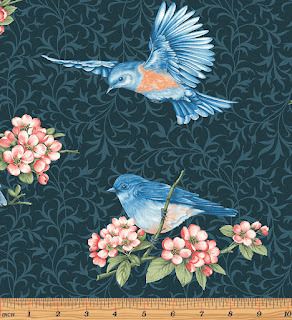 That was on purpose—wherever you live, whatever bluebird is in your neighborhood, you’ll find it in the fabric. The Eastern and Western look quite a lot alike; they have a peach breast. The Eastern wears a collar, and the Western wears a stripe on its back. They look a lot alike from the front. But the mountain bluebirds—they’re blue. And what kind of flower did you pair the birds with? Crabapple blooms. Bluebirds will flock to them, and crabapples are everywhere. It’s also a nice color contrast with the blue. We’re always thrilled to see one of your signature stripes in a collection. Yes, this is a split stripe, between cream and navy. It’s a wider set-up than some that I’ve done in the past. That’s because the bird tails extend farther. Tell us about the twig pattern in the background. You’ve got to have some kind of fill, a little bit of activity for a background. 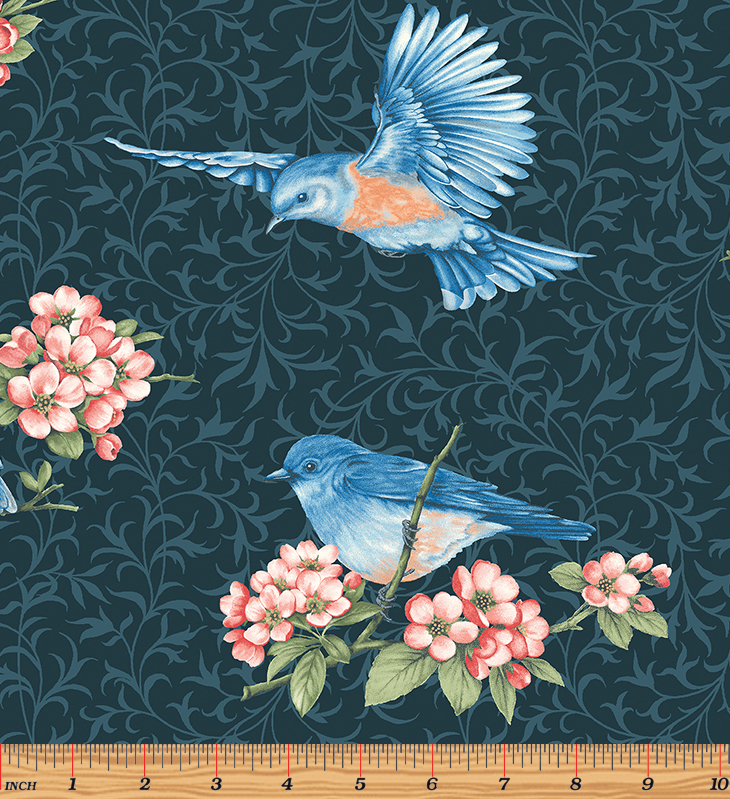 I chose a twig pattern in this case, and then used it as a coordinate and in the background of the cutable bluebird prints because then you can use the two fabrics together. 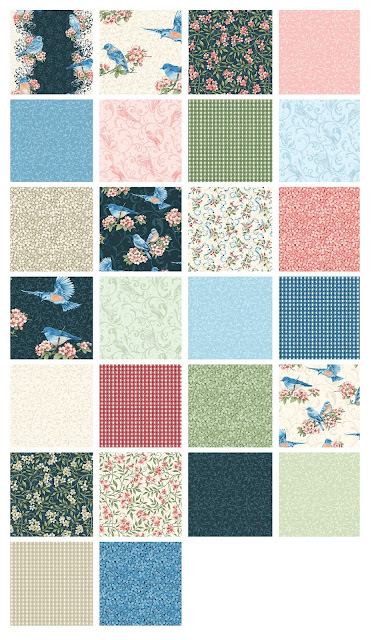 What’s your favorite fabric from the collection? Probably the stripe. If it isn’t the stripe that it would be the allover bluebirds. There are two bird prints—the allover, which is more packed with birds, and the cutable, which has the birds spaced out to allow more easily for fussy cutting. The cutable version is spaced nicely to work as a backing fabric as well. More packed than the cutable. 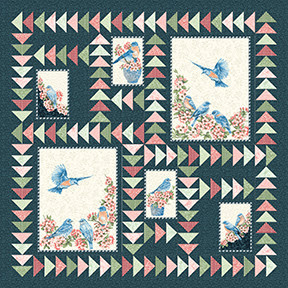 Jackie designed a free quilt pattern, "Bluebird Party," for our website featuring the Bluebird Gathering panel and coordinates. Click here to see the entire Bluebird Gathering collection. 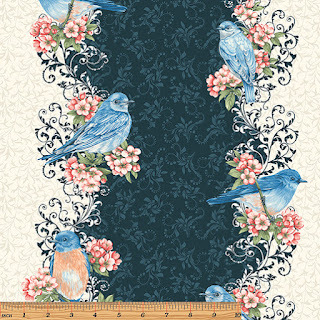 Jackie also recently had a quilt, "Interchange," featured in McCall's Quilting magazine using the Bluebird Gathering collection. 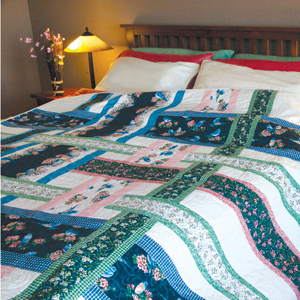 Tell us about your Interchange quilt featured in McCall’s Quilting magazine. I wanted to be able to do something using the stripe in a larger format. So my thinking was, “how can I have bigger chunks of stripe?” This design provided an opportunity. Each stripe is flanked with something—using the tonals primarily. There are so many bigger prints in this collection with the allover flowers and the birds and the multicolor scrolls, all done a couple ways. With all these good-sized prints, this design allowed me to find a way to use those all together. I really like being able to see all the fabrics in large pieces. The quilt uses partial seams. Those seem to make people nervous, but there’s nothing to them. They’re really quite simple. Click here to learn more about Jackie and her work. Click here to find the kit for Interchange. I love this collection! 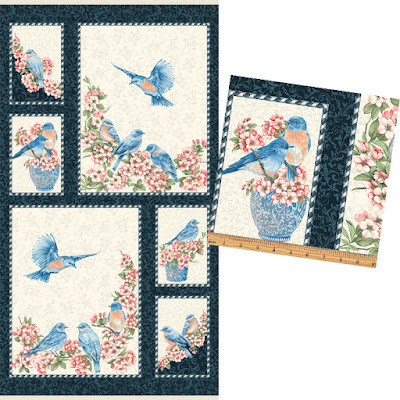 The split stripe has a delicate, lacy look that is fabulous paired with the bluebirds. Another of Jackie's great collections with a variety of wonderful tonals supporting the main prints. Beautiful fabric, I can't wait to see it in shops. This collection is absolutely darling. I'm falling more and more in love with every blog post! !